Here at Torrington Dental Care, we offer a wide range of services designed with the optimal dental health and wellness of our patients in mind. Dental implants are just one of the many wonderful services we offer our patients to help them replace any number of missing teeth. Additionally, the entire procedure can be completed in-office with the option of sedation to ensure a pain-free and pleasant experience during every visit. We invite everyone in Torrington to be a part of our growing dental office and encourage you to come try us out today. Call us now to schedule a no-obligation consultation with Dr. Kuzmin. 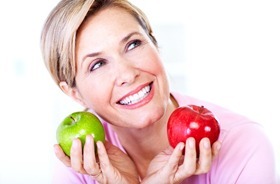 Why Choose Torrington Dental Care for Dental Implants? Implants are the only treatment that replaces both the root and crown of a tooth, creating something that is much closer to nature in both look and function. Because implanted teeth are secured in the jawbone, patients don’t have to worry about them moving around no matter what they are eating. 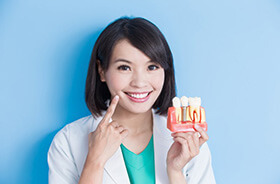 Bone loss is common after tooth loss, but dental implants are the only treatment that can stop and even reverse it, which helps patients maintain a healthier and more youthful face shape. With proper care, implants can easily last for 30 years or more. 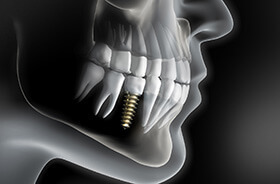 Once we’ve determined that a patient is a good candidate for dental implants, the implant or implants themselves must be surgically placed within the jawbone. 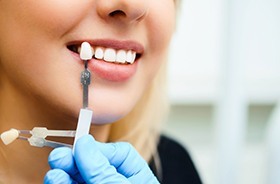 This creates an enduring foundation for the replacement teeth and helps preserve oral health as well in the long-term. Our team is happy to have the specialty skills and advanced training needed to perform this service right here in-office instead of having to refer our patients to outside specialists. Once the dental implants are successfully situated, they will need a period of time (typically a few months) to bond with the patient’s natural tissue. After this process is complete, custom-made dental restorations can be used to cover the implants and replicate the teeth. If we are restoring a singular implant/tooth, an all-ceramic dental crown will be used. This new crown will be able to fit in place between natural teeth without requiring any negative alterations or reduction. Because this restoration will have the same two-part structure as the teeth that surround it, it will blend seamlessly into the smile. Alternatively, if there is a gap of multiple consecutive teeth that requires restoration, our team can place two dental implants on either side to accommodate a full bridge, anchoring it securely in place. This method is far superior to a traditional bridge, which requires healthy teeth to be filed down to hold new crowns. Dentures can also be paired with state-of-the-art dental implants to provide a secure and permanent solution to extensive tooth loss. 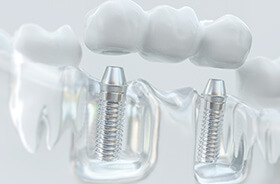 In fact, this method is very cost-effective, as our team can use a small number of strategic dental implants to anchor the prosthetic in place instead of allocating one implant per tooth. 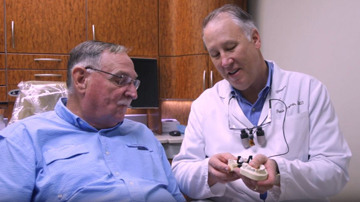 Patients may choose to have their new teeth anchored permanently in place or maintain a removable denture that allows for extra convenience – both options are available. If a patient needs to replace an entire arch of teeth at once, Teeth In A Day are available. This style of reconstructive treatment involves the placement of four to six dental implants at strategic angles, followed by the attachment of a custom, highly lifelike prosthetic. Your new teeth can be placed directly after the surgical treatment, which means that this procedure truly lives up to its name! Better yet, the use of fewer implants makes it more cost-effective as well. For dental implants to succeed, the patient’s jawbone needs to have enough healthy bone structure to support their placement and hold them securely in place. Unfortunately, patients who have struggled with periodontal disease or long-term tooth loss may discover that their jawbone quality is too compromised to make this transformative procedure viable. Thankfully, bone augmentation is available here in Torrington. During this procedure, bone graft material will be attached to the exposed tissue and then sutured close to encourage new, healthy growth. As a Diplomate of the International Congress of Oral Implantologists, Dr. Kuzmin has taken the special training needed to perform the entire implant procedure himself, including the surgical placement we outlined above. 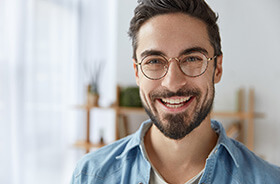 This all-inclusive approach saves patients from the hassle and expense of having to visit an outside specialist, plus they can have the peace of mind of working with the same dentist and team that they trust the entire time. 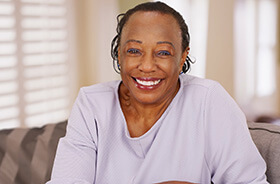 A key thing to know about dental implants is that there is no set price for the procedure, as it can vary quite a bit depending on a patient’s specific needs and situation. Regardless of this, however, they are still the most cost-effective replacement available today thanks to their longevity. 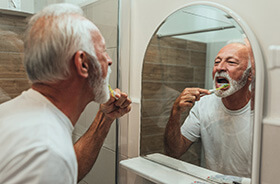 Regular bridges and dentures typically need to be completely redone every 7-10 years, while dental implants can easily last for 30 years or more, making them a onetime cost for most patients.